It’s 4:30 a.m. and I am exhausted. The effort it takes to lift myself out of my warm bed is tremendous. However, I am up to nurse my two-month-old daughter. I move quietly to the La-Z-Boy in the corner of the room and wrap us up in a warm blanket. My baby girl begins to cry, but just as I’m about to become overwhelmed, I take a deep breath and remind myself that she’s only a baby. She doesn’t know how to communicate yet, and I should be grateful that she needs me, just as the children I work with. I am a registered Defeat Autism Now! doctor and specialize in the treatment of Autism Spectrum Disorder. I work with wonderful children who have amazing parents whose love and patience have been an inspiration to me as a naturopathic physician and a mother. My work has made me a better mother and has taught me that I am lucky to have a daughter who cries and needs the physical contact of her mother to comfort her. My daughter drifts off to sleep and I slowly transfer her to the bed. Downstairs I turn on my computer and begin to prepare for the day. I currently work part-time so the quiet morning hours are ideal for reviewing laboratory reports and case files. When I get to work, my first visit is with a little girl who started treatment unable to make eye contact and had no desire for interaction with other people – including her devoted and loving mother. Now, one year later, she is beginning to use 2-3 word sentences. Not only does she hug her mother but she even gives me a tentative squeeze before she leaves. My heart is bursting! There are so many children who could benefit from the biomedical treatments I employ, but many people are not aware of them since they are not considered mainstream. My patient’s development has been greatly enhanced. She is leaving behind some of the fog of autism. I have a brief break and sneak back to check on my daughter who is in the staff area with her nanny. She is sleeping soundly and as I gently rub her soft cheek I am grateful she is not plagued by the digestive problems or chronic infections that often accompany autism. I hope as I give her a light kiss on the cheek that she won’t be one of the one of the 165 children Health Canada says will be diagnosed with autism this year. Autism Spectrum Disorder is one of the most common developmental disorders affecting children today. The amount of children diagnosed with ASD 10 years ago was four in 10,000. Now, a child is diagnosed with autism every 20 minutes. 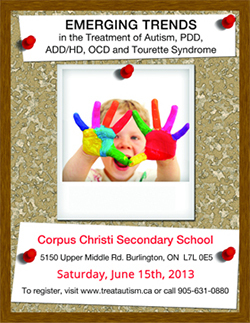 This is a health crisis that extends far beyond the individuals and families dealing with ASD. When a child is diagnosed with ASD, they generally have problems with language and social and cognitive development. These children often cannot make eye contact or show affection. Children on the autism spectrum can become obsessed with different objects and spin or flap their arms. The ability to process information in their brains is impaired. It would be like trying to listen to a single person when dozens are speaking to you at once. They are overwhelmed with stimuli and don’t have the ability to process information correctly. ASD is often present from birth, but can also be regressive. Children who appear to be developing normally typically start to lose the ability to communicate, interact or think like other children. This regressive form of ASD often becomes most apparent between the ages of 18 and 24 months. The biomedical treatments I employ are based on research regarding the triggers of autism and on methods of diagnosing and treating. Biomedical treatments may not help every child with ASD but, in my experience, they help the majority of children develop skills that change their lives for the better. The courageous physicians and researchers of the Autism Research Institute have developed research-based protocols that have helped thousands of children. These treatments change the lives of children with ASD and their families by increasing language and communication capacity, as well as social interaction and cognition. It is my job to help parents understand the potential weaknesses in their child’s system. I tell them, by testing for weaknesses and supporting them, dramatic increases in development can be seen. One approach to treatment is called “functional medicine.” Functional medicine addresses underlying problems that are unique to each person. Biomedical treatments include vitamins, minerals, diet, amino acids, anti-microbial drugs or botanical medicines and pharmaceuticals. What makes these treatments different is how they are used. The Defeat Autism Now! approach uses individualized protocols that address individual differences in function. This is why so many children benefit from biomedical treatment. The Intensive Behavioral Intervention addresses behavior but does not enhance development. The ARI collects ground breaking research from around the world and helps physicians develop a system of identifying underlying weakness. The biomedical treatments then help correct the impairments, which can result in enhanced language, sociability and comprehension. My next patient has been undergoing biomedical treatment for the past six months. Joe is a five-year-old boy with bright blue eyes. Six months ago he couldn’t make consistent eye contact, wasn’t able to play with other children and had use of less than 50 words. After an initial assessment I ordered blood tests and food allergy testing. The results showed that Joe had detoxification impairments, problems with B12 absorption and an allergy to eggs and dairy so I developed an individualized protocol including diet instructions, B12 injections, essential fatty acids and probiotics. After a month, Joe began using more words. After three months he was able to use short sentences. During today’s visit Joe tells me clearly that he has made two friends at school and is having the first sleepover of his life this weekend. Throughout the rest of the day I have similar cases. Some children are progressing quickly. Others need special testing to identify a better protocol. The majority of my patients have improved significantly. On my way home I feel tired but invigorated. There is no traditional treatment and the biomedical intervention I employ is revolutionary and incredibly rewarding for me as a doctor. Seeing children progress with each visit is a miracle and I love being part of it. Today a little girl, who once shunned affection, gave her doctor a hug goodbye. Today, a little boy has made new friends. Many of us with children take these simple things for granted. For a parent whose child is on the autism spectrum, biomedical intervention shines an incredible ray of hope on a devastating disorder. Published 7 May 2009. All Rights Reserved.